Last 11 April, APC held its Graduation Day, with four boys and four girls comprising our 10th batch of graduates. 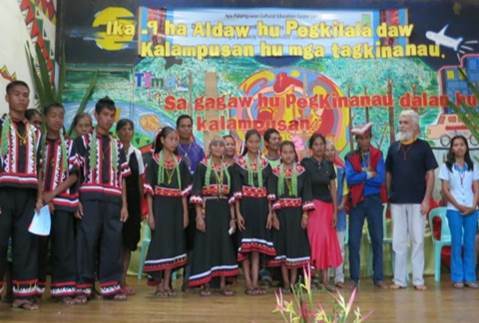 Six of these young people are Pulangiyen, one is Bisaya and another is Adjawanen. Three of them lived in the dorm and all of them will proceed to high school. Close to 200 people came to the graduation, not just from Bendum but also from neighboring villages and the villages of non-Bendum students. Parents, siblings, and relatives came to see their family member graduating. This is much cause for celebration and a source of pride and hope for the families. The event is also an opportunity for people to build relations with other clans. The uncle of the Adjawan graduate spoke in behalf of the parents – he gave thanks for the opportunity given his niece to learn and expressed a wish for a similar school to be built in their village. The graduation’s theme was “Sa gagaw hu pegkinanau dalan hu kalampusan,” which means, “A love of learning is the road to success.” A college graduate from Bendum who recently passed the teachers’ licensure exams was invited as guest speaker. She talked about her own family’s struggle to send her to school and exhorted the graduates to strive hard in their own education. The hope of APC graduates and their families is for them to eventually return to their villages and serve not only their families, but also their place and their people. Earlier graduates of APC now work in the different programs in Bendum—some as teachers in the school and others in the agro-forestry and youth training programs.